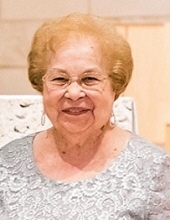 Delores Della Monica (nee Cristella) of Barrington, NJ, passed away on January 24, 2019 at the age of 89. Beloved wife, to the love of her life, for 53 years, the late Anthony "Tony" Della Monica. Loving mother of Delores "Dee" Peters (Jerome) of Fairfax, VA and Anthony "Tony" Della Monica (Ginny) of Marlton, NJ. Devoted Grandmother “MomMom” of David, Kyle (Lauren), Drew (Kathryn), Brett, Sean and Meredith. Dear sister of Rita Miller of Edgewater Park, NJ; Charles Cristella (Nancy) of Ocean City, NJ and Mary Vitale of Clinton, CT. Dear sister-in-law of Michael DePierri and the late Marie DePierri of Barrington, NJ. Delores’ greatest enjoyment came from spending time with her family, close friends, and being an active member of Barrington Borough’s Young at Heart Seniors Group. Relatives & friends are invited to her viewing on Monday evening, 7 to 9pm, and Tuesday morning 9 to 10am in the Schetter Funeral Home 304 W. Marlton Pike, Cherry Hill, NJ. A Mass of Christian Burial will be held on Tuesday 11am at Mary Mother of the Church, 20 Braisington Avenue, Bellmawr, NJ 08031. Entombment New St. Mary's Cemetery, Bellmawr, NJ. In lieu of flowers, the family requests contributions in her memory may be made to the Parkinson’s Foundation. To send flowers or a remembrance gift to the family of Delores Della Monica, please visit our Tribute Store. "Email Address" would like to share the life celebration of Delores Della Monica. Click on the "link" to go to share a favorite memory or leave a condolence message for the family.